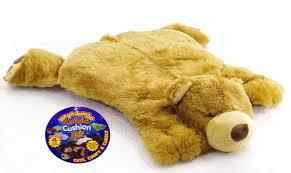 regular pillow in the belly portion and the legs and head and tail are all stuffed and attached. I used to spend many a day "fixing up extra loved bears" from the 4 nieces. LOL "Auntie his ear fell off, Auntie he lost an eye etc." then my chore will be to get a bed pillow and find a HUGE box to put him in for Christmas. doesnt every kid love a HUGE gift? when I made them 20 years ago, by changing out the tail and ears I got a bunny, bear, cat and dog. Are you working on Christmas yet? so far this guy has his tail and ears done and I am doing the body next. kinda shaped like an H and then the top part is in two and overlap for the pillow opening. then the rest just gets attached. I love working on the face to give him personality. You could make a monkey too! Christmas? I can't think that far ahead right now.